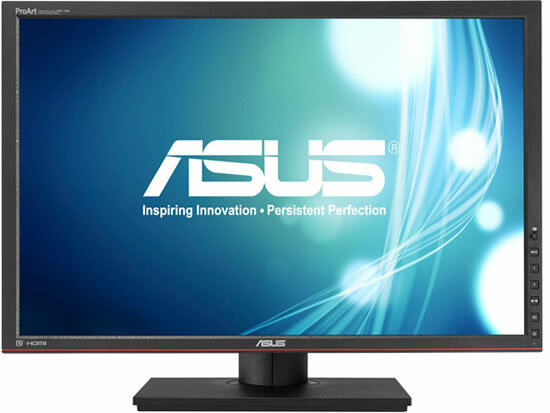 Asus today announced the PA249Q ProArt Series LCD Monitor, a professional 24-inch display. The Asus PA249Q ProArt Series LCD Monitor is pre-calibrated at the factory for unmatched color accuracy (∆E<3) and features independent six-axis color control with outstanding color space reproduction — 99% Adobe Wide Gamut RGB, 100% sRGB and 120% NTSC. In addition, the PA249Q supports 10-bit deep color for more natural transitions between different hues. The PA249Q also features a brightness rated at 350cd/m² and an 80,000,000:1 ASUS Smart Contrast Ratio for enhanced image contrast. The ASUS PA249Q ProArt Series LCD Monitor is LED backlit and features AH-IPS (Advanced High-Performance In-Plane Switching) display technology for reduced energy consumption, superior color accuracy and increased backlight transmission for an overall brighter image. The Asus PA249Q also features two user-customizable shortcuts for frequently used monitor controls. The PA249Q ProArt Series LCD Monitor has DisplayPort, HDMI, DVI-D and D-Sub ports, and can display content from two video inputs at the same time. The Asus PA249Q also features a four-port USB 3.0 hub for convenient pass-through connectivity at speeds up to 10 times that of USB 2.0 with compatible devices. The monitor is mounted on a versatile stand with full tilt, swivel, pivot and height adjustment.